The Port Isabel Event & Cultural Center has capacity for small groups and groups up to 1,200. 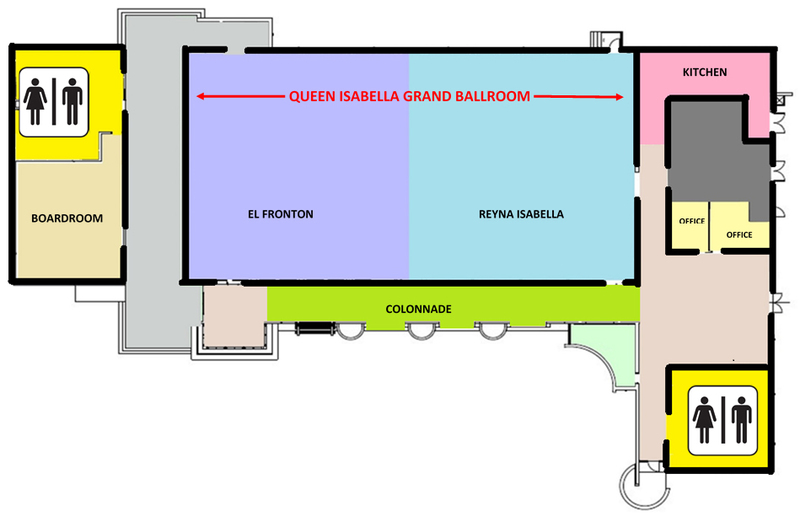 The QUEEN ISABELLA GRAND BALLROOM features 8,000 square feet of floor space. It can be divided into the REYNA ISABELLA and EL FRONTON offering 3,968 square feet each. Flexible and open, the BALLROOMS can host social events, concerts, fairs, conferences or presentations. The BOARD ROOM has 1,080 square feet of corporate meeting space. PIECC’s PREP KITCHEN just off the QUEEN ISABELLA GRAND BALLROOM or the REYNA ISABELLA makes food service at your event a matter of convenience. QUEEN ISABELLA GRAND BALLROOM – 8,000 sq. ft.
REYNA ISABELLA BALLROOM – 3,968 sq. ft.
EL FRONTON BALLROOM – 3,968 sq. ft.
Boardroom – 1,080 sq. ft.
Colonnade / Patio – 480 sq. ft.